Spring isn’t the only planting season. Fall is also a great time for planting. In fact, the cooler temperatures of autumn provide what may be the very best time to plant trees. Here are five terrific trees that Dinslage recommends for fall planting. Many people naturally think of “red” when they think of maple trees, because of the bright crimson color of their autumn leaves. But the name “red maple” refers to the color of the flowers that emerge on this type of maple tree (Acer rubrum) in early spring. The green leaves during the growing season turn red in the fall, yet another reason for the common name. Red maples are native throughout a wide range of the country from west Texas through Minnesota and all points south and east. Typically, these trees are found growing in cool moist and swampy soils. The leaves emerge after the red flower clusters appear in the spring. The yellow-green leaves age to dark green with a silvery underside. Red maples grow pyramidal shape when young, and they look great when planted in small groups on larger properties. A red maple can reach a mature height and width of 40 to 60 feet, so put these trees in a space they can grow into. 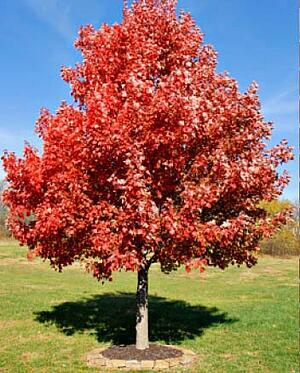 Red maples also make great specimen plants for lawn or street tree plantings. The river birch (Betula nigra) is the most planted birch tree in the U.S. The river birch is the hardiest of all birches—handling Zone 3 winters and hot summers. It’s a fast growing, trouble-free tree that is sure to delight in every season. This tree is famous for its peeling bark, which is beautiful all year. The light tan outer layer naturally peels back to reveal beautiful salmon- and cinnamon-colored patches beneath, and it’s a truly stunning sight in the winter. The graceful branches and the colorful, textured bark are sure to brighten even the darkest winter day. In the spring, a river birch will awake to grow new light green leaves and female catkins that stand up on the ends of the branches. As the leaves mature in the summer they are a beautiful, shiny, dark green almost diamond-shaped leaf. In the fall, a river birch tree transforms again. The male catkins emerge dripping from the branches and the leaves turn a brilliant butter-yellow that’s guaranteed to light up any landscape. A mature River Birch reaches 25 to 50 feet tall and 25 to 35 feet wide. A mature white oak (Quercus alba) reaches about 85 feet tall, and it provides shelter under its massive limbs that extend far out from its trunk. It’s not uncommon for the white oak to be wider than it is tall. The branches grow in wide angles, forming abroad, rounded crown with a rugged appearance. The white oak’s five-inch leaves turn red to purple in autumn, and one-inch acorns tumble to the ground in October. The acorns are a bit smaller than other oaks produce, but they are less bitter. Native Americans used them as a food source, and wildlife love them. 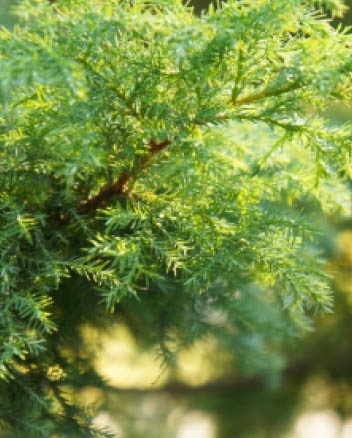 The eastern red cedar tree is a popular evergreen conifer. A single tree makes a great stand-alone specimen in a yard, and several planted together can make a beautiful and effective privacy screen. If you’re a bird-lover, this is the tree for you. The eastern red cedar (Juniperus virginiana) grows in a 40 to 60 foot pyramidal shape that is dense but somewhat irregular, providing terrific cover for birds and other wildlife. The bark has a shredding nature that is useful for nest construction. The one-quarter-inch, dark-blue cones produced by the female trees are a valuable food source for many bird species. The eastern red cedar has blue-green foliage that sometimes turns a darker brown-green in the winter months. Step close and you’ll detect the cedar scent, prized by many who construct cedar chests and closets from the wood of these trees. Hardy and easy to transplant, this is a tree you can plant and forget about. It will adapt to almost any conditions and provide years of enjoyment in the landscape. The ginkgo tree (Ginkgo biloba) is a truly unique tree that has no close living relatives on Earth. A ginkgo tree can tolerate most anything. It does well in poor soil and compacted soil, and it can withstand drought, winter salt and even air pollution. They are usually deep rooted and resistant to snow and wind damage. The leaves on the ginkgo are an interesting fan shape that flutters in the slightest breeze. 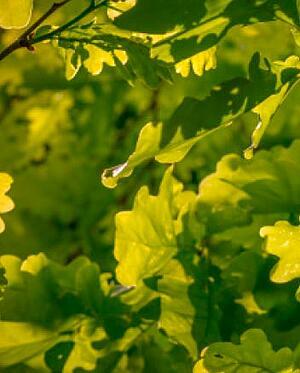 ginkgo leaves are a beautiful dark green color from spring to summer. In autumn the leaves turn a brilliant, saturated yellow. A female ginkgo tree produces a yellow orange, plum-like fruit. The nuts inside the fruit are considered a delicacy in Asian cooking. The extract from the leaves are used in supplements to improve memory, symptoms of dementia, and blood flow. In the right place in a landscape, a ginkgo tree can continue to thrive for 1,000 years. It is pest- and disease-resistant, and can reach a mature height of 40 to 60 feet with a spread of 20 to 40 feet across.